The huge value of vaccinating more children and young adults for influenza is being seriously underestimated, experts say in a new report, while conventional wisdom and historic vaccine programs have concentrated on the elderly and those at higher risk of death and serious complications. A computer modeling analysis was just published in the journal Vaccine, in work supported by the National Institutes of Health. The study suggests that children in school and young adults at work do the vast majority of flu transmission. Programs that effectively increase vaccination in those groups would have the best payoff, the research concluded. The key point: If you don’t catch the flu, you can’t die from it. Breaking the cycle of transmission benefits everyone from infants to the elderly, the researchers said. And at stake are thousands of lives and billions of dollars a year. “In most cases, the available flu vaccine could be used more effectively and save more lives by increasing the number of vaccinated children and young adults,” said Jan Medlock, a co-author of the study and researcher with the Department of Biomedical Sciences in Oregon State University’s College of Veterinary Medicine. In a perfect world and in accord with recommendations from the Centers for Disease Control and Prevention, researchers agree that almost everyone over the age of six months should get the flu vaccine, unless they were allergic to the shot or had other reasons not to take it. But in the United States, only about one-third of the population actually gets a flu vaccine each year. Historic efforts have been focused on people at higher risk of death and severe disease – often the elderly, and those with chronic illness, weakened immune systems, health care workers or others. With existing patterns of vaccine usage, the problem is enormous. Seasonal influenza in the U.S. results each year in an average of 36,000 deaths, more than 200,000 hospitalizations, an $87 billion economic burden, and millions of hours of lost time at school and work – not to mention feeling sick and miserable. 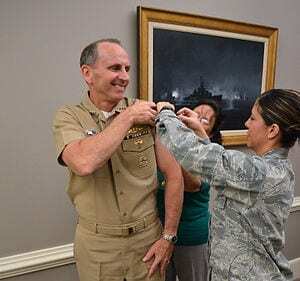 The flu vaccine up until 2000 was only recommended for people over 65, Medlock said, and other age groups were added in the past decade as it became clear they also were at high risk of death or complications – children from age six months to five years, and adults over 50. Just recently, age was taken completely out of the equation.